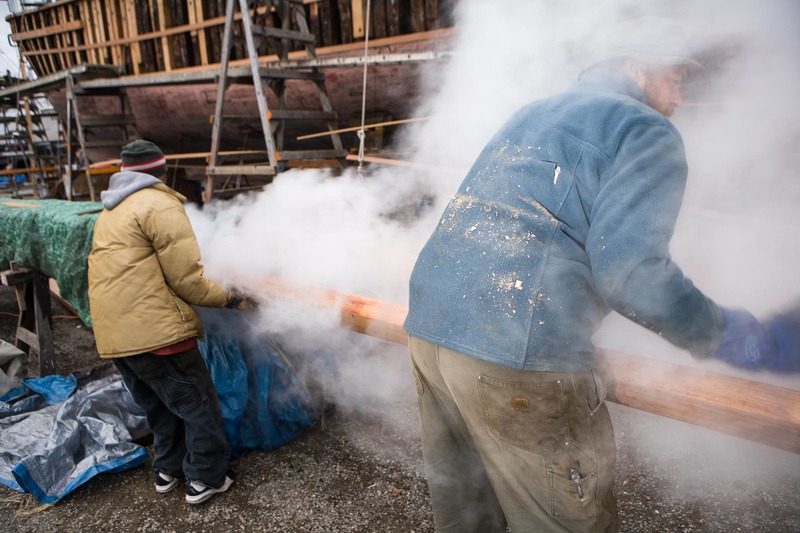 A crew of three people works on the old sailboat, Merrie Ellen, at the Port Townsend shipyard. She was built at the beginning of the 20th century in British Columbia, Canada. The new owner brought the sailboat to Port Townsend for a big repair and installment of brand new planks. Every plank must be steamed for anywhere between 2 and 3 hours before it can be installed. Considering the precision required for this task, the installation process takes surprisingly little time once the plank is steamed properly. The Port Townsend shipyard is known for its masterful shipwrights and many wooden boats schools.